In my last post, I promised I'd talk about some of the good aspects of Gears of War. So, here are some of the things that the game does well. While I lamented in my previous post about the boring nature of the appearance of Gears of War, this is mainly because of the colour palette. However, despite the fact that the aesthetic artistry is somewhat lacking, the technical side of things is fantastic. I'm not simply talking about the fact that the Unreal Engine looks really good and that there's a great deal of fidelity in the visuals, even though that's perfectly true. The success of the art is how well it fits the overall setting and theme of the game. The setting of the game is a world torn apart by ongoing conflict, destroyed but the locust horde and also by the humans themselves. Despite that the levels aren't pretty to look at, they fit the setting of the game perfectly. The painstakingly created levels and environments all reek of a planet torn to pieces by conflict, and this constant reinforcement creates a cohesive and realistic backdrop for the game itself. Really and truly, when it comes to a shooter, the important part is the gameplay and this is an area where Gears can and does deliver. Cover based fighting, run and gun, flanking, defense segments, rail shooter pieces and bosses that need specific tactics.... they all combine into a complete and diverse package. Sure some of these segments can get pretty darned annoying at times, but they add variance to the gameplay to make it interesting. Even though they sometimes raise the player's blood pressure through repeated dying at certain points, having set pieces does make for a more engrossing gameplay experience. Variety makes the game more interesting, even if at times it is frustrating. 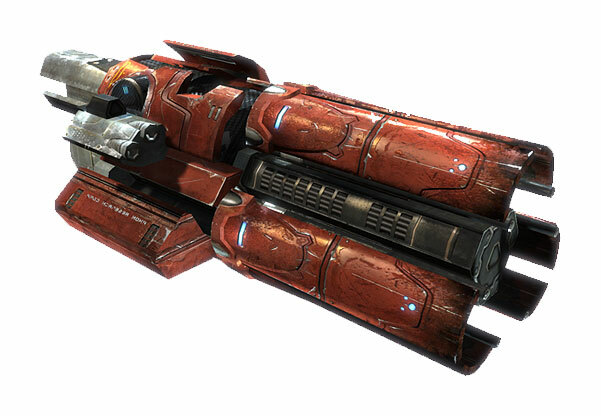 Of course, such variation should not go down the Dead Space route of having turret sections that are so randomised that it makes success more an issue of luck than skill, but fortunately Gears doesn't do that. This may sound weird from someone who is such a huge fan of player choice and story-driven games, but I love co-operative gameplay. Playing a game with your friends and getting the sense of achievement together of overcoming challenges is superb. This has been the case all the way back since the days of Doom. The fact that Gears allows you to "pick up" your buddy who has "died" further promotes the sense of teamwork that all co-op play tries to instill. Overcoming a goal on your own is fun, but doing it together with a friend is even better. I heartily commend any FPS (or any game) that allows players to work together to win - any game that offers this as a seamless part of the experience is offering good replay value. Gears of War's "active reload" mechanic deserves a mention all of its own for how it adds a new mini-game into the typically mundane task of reloading. For those not aware of the mechanic, while reloading, a small gauge moves along a line which is the default time taken to reload. 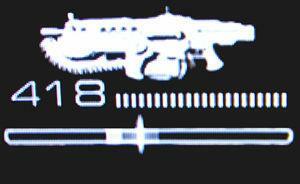 However, along the gauge there is a specified range in which the player can hit the reload button again in order to reload faster. If they hit it at the very beginning of this range, they not only get the fastest possible reload, but also gain a temporary damage boost. 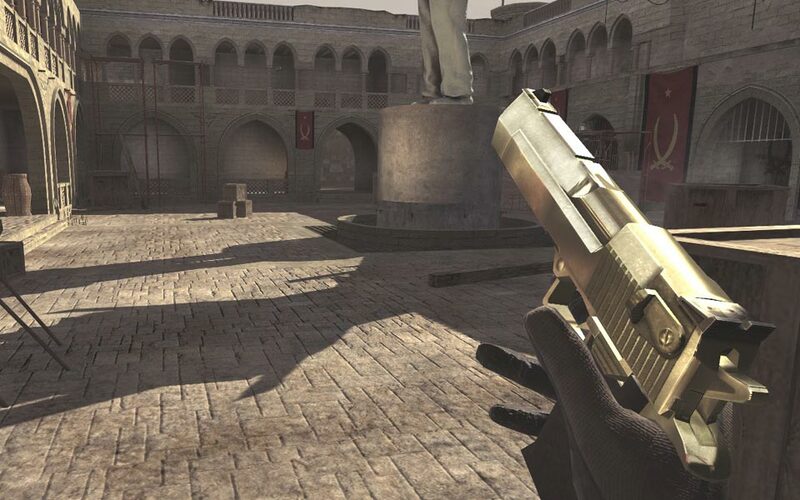 However, should the player hit the reload button outside of this "sweet spot" range, they will actually take longer to reload than if they had done nothing at all. Aside from making the process of reloading inherently more interesting, it also forces the player to decide their approach to the mechanic. If under pressure during a firefight, does the player want to try and get the damage boost? This presents the risk of pressing the button too early and putting them out of action for longer, whereas they could simply wait a fraction of a second longer and almost certainly guarantee a faster than normal reload. This is a perfectly integrated mini-game that even provides the player with a small degree of choice that affects gameplay. Mechanics like this serve to make games more interesting and fun. 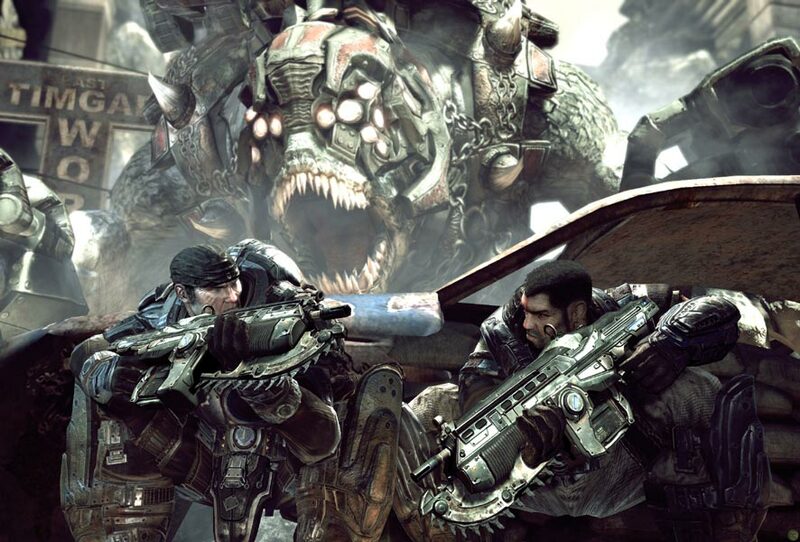 Gears of War isn't the best game created, but it is an enjoyable shooter romp. If you enjoy a game and find it fun, then it has definitely succeeded on some level, and Gears certainly fits that bill in my books. I realise I've been quiet for a little while, but I have been busy with various things. I also haven't come across as many thought provoking discussions on game design in the past week or two as I frequently do. If anyone has a topic that they think would be interesting, please let me know. However, in something a little different from usual, I'm not going to discuss RPGs in this post. 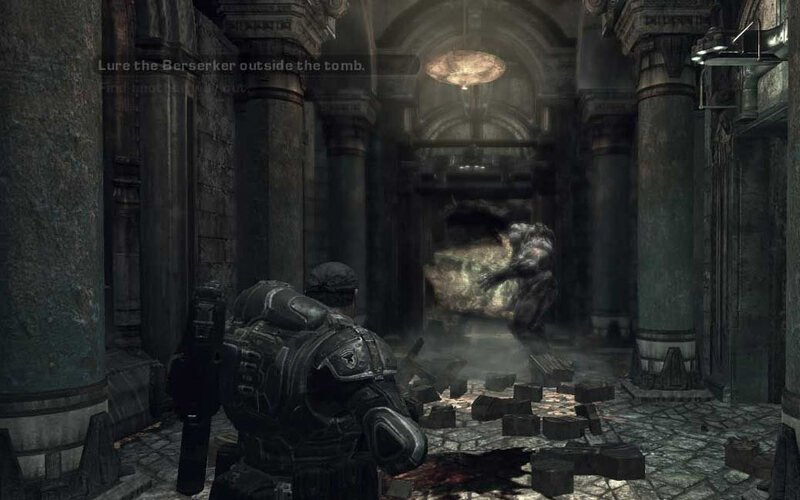 I've recently been playing Gears of War (yes, the original) on XBox360, both single player and co-op. While I could write a full review of the game, there are already plenty of those out on the Internet. So instead I'm going to look at some of the design negatives and positives - in today's post, let's look at the negatives. Please, if you're in the game industry now, or ever are involved in it, adhere to this simple rule. Make cutscenes skippable. It's that easy. Don't force the player to sit through a scene over and over again where they have limited or no control over their actions while they wait for it to end. This applies double if the game has checkpoint saves. If the player dies in a subsequent combat section, they're forced to sit through the rigmarole of the sequence again. What if the player is replaying the game and already knows what happens in all the cutscenes? They just want to play for the action. If you (as the designer) are worried about the player accidentally skipping cutscenes, force the player to press two separate buttons in order to skip it. If all else fails and you absolutely must have an unskippable cutscene (though I'd really expect you to have a damned good reason as to why), save the game automatically afterwards. Can we get rid of checkpoint saves already? We're no longer scrimping and saving hard drive save, so let's do away with checkpoints and allow the player to save whenever they want. You can limit it so that the player can't save while they're in combat, and that'd be fine, but don't force the player to redo whole sections simply because that's where you wanted to break it up. There's really no need for this kind of design, as it really doesn't add anything to the game. Third person shooters don't work in close quarters. It's pretty much that simple. You don't have the fine grained control of a first person shooter, and your screen is partially filled with your character. If you start cluttering up the space with walls, pillars and other obstacles, pretty soon the player is going to have an extremely limited field of vision which serves little purpose except to obscure and frustrate. Even worse, when you're trying to move quickly, you frequently end up sticking to cover or a wall because you get to close to it. There's no denying that the colour palette is largely a see of drab brown and grey. There's no vibrance in the game's appearance, and the most regular splashes of saturated colour you get are when the screen is sprayed with blood, either your own or that of your enemies as you chainsaw them to death. The visual fidelity of the graphics are good due to the Unreal Engine, but you rarely spend time gawking at the scenery because of the drab colour scheme and largely uninspiring visuals. Admittedly this more applies on the higher difficulty levels where players are pretty much expected to nail everything, but it's still relevant. Punishing the player with death simply because they popped their head up just as the enemy decided to fire a rocket or a torque bow arrow doesn't really add to the challenge in a meaningful fashion, but it does add to frustration. One mistake shouldn't kill the player, at least not unless it's a really stupid one. When I'm playing a shooter, I don't expect fantastic writing. People are playing the game for the gameplay, not the in-depth narrative. But does that really mean that the characters have to be fairly shallow stereotypes, and the plot an almost completely predictable and straightforward tale? This criticism could be directed at so many shooters (or games in general for that matter), because narrative in games still hasn't moved past basic tropes for the most part. Of course, Gears of War wouldn't be popular if it didn't have some good aspects... but I'll leave those for my next post. The other night I eagerly downloaded and fired up the Dungeon Siege 3 demo. I quite enjoyed the first game, and while the second dragged on and was tedious at times, it was still a fairly enjoyable action RPG clickfest romp. 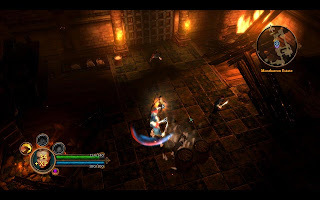 Blizzard's Diablo series still reigns supreme in this genre as far as I'm concerned, but the two Dungeon Siege games have been some of the more entertaining competitors. And no matter what happens, the first Dungeon Siege was still a great achievement for the continuous world / "no loading screens" approach it showcased. When I heard Obsidian were looking after the third installment, I was a little excited. 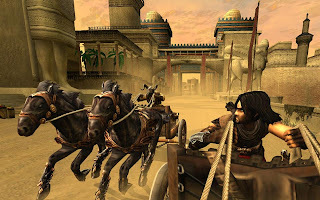 I'd generally say I'm a fan of Obsidian's work - their titles are frequently let down by technical issues (engine, lighting or modelling), or having some of their content removed because the studio tries to bite off more than they can chew in terms. But on the whole, they produce interesting games with reasonably solid game mechanics, and typically have excellent characters and writing. 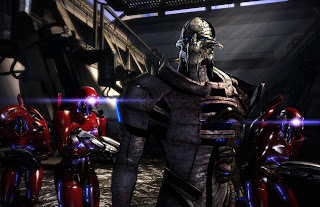 KotOR 2 was great until the horrendous ending, Mask of the Betrayer is one of the best roleplaying adventures I've had, and I'd consider Alpha Protocol one of the most unfairly maligned games of the past few years. I like Obsidian, hence why I was eager to try this new demo. Then they turned around and slapped me in the face as though I'd called them something unpleasant. The Dungeon Siege 3 (let's shorten that to DS3 from now on) demo gave me the option of picking a sword wielding male, or a fire-wielding female "archon" (some kind of half-human, half-fire-spirit). I confess that I have a soft spot for mages in action RPGs, so I picked the archon and jumped into the fray. Controls were explained: basic movement, attacking, blocking, dodging, special ability use. The controls seemed simple enough and at a first glance seemed like they would make for an enjoyable game. It soon dawned on me that I couldn't have been more wrong, not even if I'd predicted Quake Wars would be the best online FPS. DS3's simplicity equates to fewer tactics than whack-a-mole, and unfortunately for it, a lot less fun. 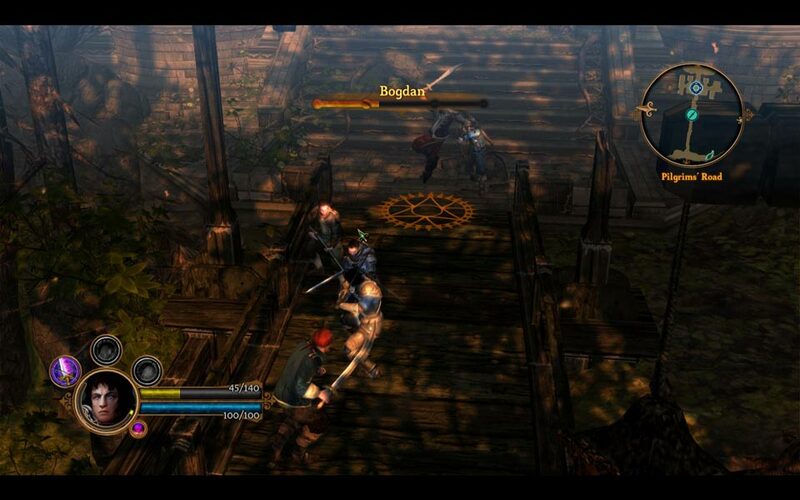 The game quickly gets into combat, which is pretty much the bread and butter of the action RPG genre. If you're playing one of these games, you're here to take on hordes of enemies in fun, RSI-inducing, keyboard-killing, mouse-destroying combat. It's the endless combat with good mechanics, and the ever-increasingly powerful loot that you use to obliterate your enemies with ever-growing power and ease that keep people coming back to play. Now DS3 may have the chops when it comes to delivering items - it's hard to gauge that from the demo, but there definitely seem to be enough statistics for the game to offer a colossal variety of items. However, that's possibly the only bright point in a title so drearily bereft of sparks of inspiration that it feels like a black-hole sucked out anything that might threaten to cause you to enjoy yourself. This is not fun. It might look like it could be, but it isn't. For starters, I've never been so comprehensively confounded by a control system in my life. The controls, particularly the camera, are hideously clunky. There's no easy way to move your character sideways without using the mouse, making any sort of tactical movement as pleasant as a particularly angry hemorrhoid. The camera is also tedious to control, with only two arbitrary zoom levels meaning you're stuck between having limited visibility of the battlefield, or not struggling to predict the attacks of individual enemies. I frequently found myself having to rotate the camera a full 180 degrees using the keyboard, which is on par with missing mouselook in an FPS. Enemies usually come in groups of at least 3, but frequently 5 or more. As such, you're usually bound to starting off with the "group stance" first. As an archon, this means getting up close and personal with enemies, whereas her 1v1 stance is a ranged mode where you really don't want to be tangling with enemies in melee. As such, you're forced to operate the combat in the opposite of what would be logical: getting into melee range where you can get beaten up substantially before backing out and finishing off the stragglers at range. While I endured a second run-through to determine that the warrior was designed by someone with at least a modicum of intelligence, the combat design for the archon is akin to something you'd expect from a poorly implemented budget title. Even with a warrior... nope, still not fun. These flaws are compounded further by the fact that the enemies do enough damage such that you merely can't just engage in the standard click-fest fare once enemies are in sizeable groups, which they almost always are. That's right, adhering to the "group stance" combat mode is typically what will get you killed faster than taking on a dragon with a putty knife. While I applaud the aim to remove the mindless hack and slash fest of continual attacks with something else, there's a need to make the replacement more engaging and exciting than the repetition that is being replaced. Once again, DS3 fails miserably, as it attempts to require incessant use of block/dodge in order to avoid taking this damage, which quickly becomes a laborious exercise that merely prolongs the battle through a series of dodge/attack beats. The special attacks do serve to help you clear enemies quickly, but tactically appear to add little to no depth in the overall scheme of things. 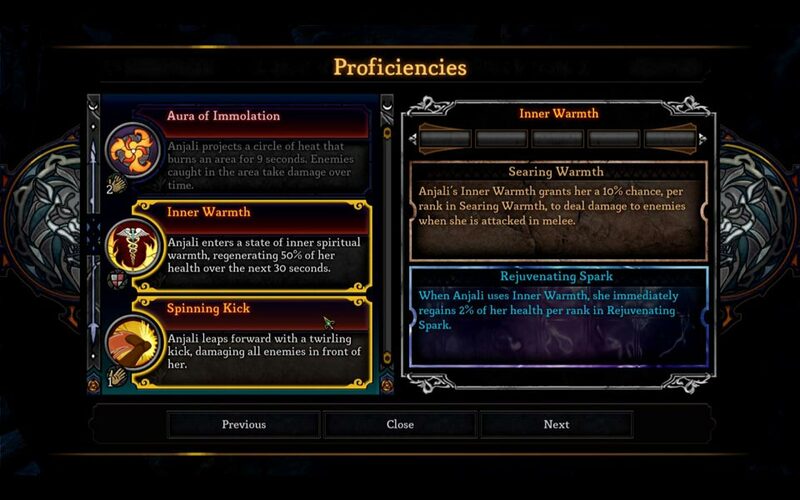 In essence, combat devolves into a series of left/right click swapping in order to succeed, and the majority of the combat is spent trying to avoid enemy attacks rather than dealing damage. Alternatively, you can use a character's inbuilt "defensive ability" aka an ongoing heal (activated by the wholly unintuitive Space & 1 key combination) to enable to reduce this tedium and largely allow you to just beat away at your enemies as per standard fare. You're not playing the biggest hero in the Land of Ehb, you're playing someone who prevails through a countless stream of ninja rolls or magical teleportation punctuated by the odd attack. Apparently the most vital skill of the legendary 10th Legion was gymnastics classes from the age of 2. Well, that and innate magical healing skills. 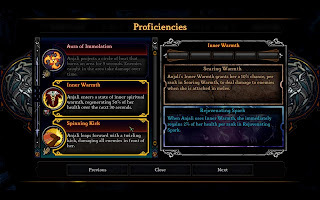 In terms of character development: you get access to 9 skills, each of which can be "empowered" to make them better; 2 "specialisations" for each skill providing different bonuses to these skills; and about a dozen "talents", each with 5 levels which provide varying passive benefits during combat. 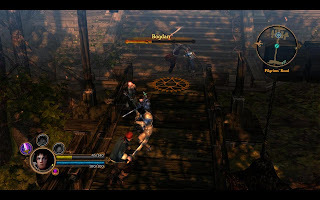 However, the relationship between these three things is muddy at best, as is the details of how the combat system works. Even the character/quest/inventory/equipment screens are poorly designed and difficult to navigate. The "equip" menu shows you your inventory, but only those items that you can equip. The "items" menu shows only the items that you can't equip, and clicking on them in this screen will ask you if you want to "transmute" them - this allows you to "sell items in the field" as it were, but for less gold than if you hauled them to a shop. I'd hate to think how much or a nightmare it would become when managing a party of characters, as navigating the menus is headache enough with a single character let alone two or more. You guessed it... this isn't fun either. The graphics upon starting are nothing jaw-dropping, though I wouldn't call the game unattractive. Animations are smooth and fluid, and switching stances for a character changes all their motions significantly, which is a nice touch. Visual effects were flashy and suitably fire-infused for my character, and were quite good elsewhere. There's a reasonable amount of detail in the game world and individual creature models, as is show-cased through the various dialogue scenes which get a little more up close and personal with them. On the whole, this aspect of the game is fairly pleasant. The writing itself here appears to be fairly standard action RPG fare. Again, it's hard to judge this from a demo, but I'd say the writing really didn't seem to be up to the sort of quality that you would typically expect from an Obsidian game in the writing department. Generally writing is the one area where Obsidian nails a game, but their efforts seem a little off here. The dialogue wheel is clunky due to the fact that your mouse doesn't actually have to hover over a response for it to be selected. Your mouse cursor traces an invisible line from the centre of the "wheel" and whichever dialogue option is crossed by that line is the "active" line. It also doesn't deselect unless you move over another dialogue option. (Leading to silly situations as per the screenshot below) This might sound like a really small gripe, but it makes the system feel unresponsive, which is bad considering you're already overwhelmed with that feeling due to the awkward combat mechanics. The solution is simple: Unless the mouse is hovering over a dialogue choice, don't have it selected. This is pretty much GUI design 101, and really not a mistake that should be made by a developer who says they are creating AAA titles. 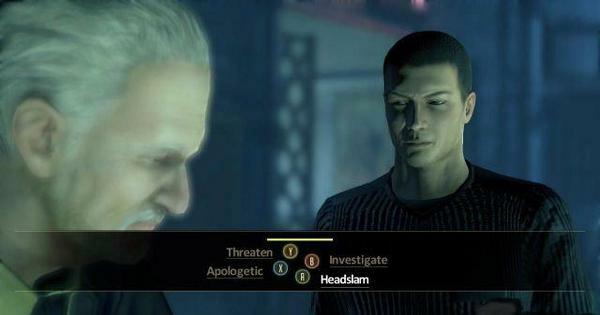 No, I shouldn't be selecting a dialogue option right now. Look where my cursor is! These quibbles might merely be annoying, but the real travesty was when I heard my character speak. I have no issues with having a voiced protagonist; I'm playing a pre-determined role, so I'm happy to have the standard "paraphrase and hear the full line" dialogue model. That wasn't the issue, my character's voice was. Evidently someone felt that an "archon" should not merely sound like an ordinary female, but should have some kind of "otherworldly" element to their voice. Stylistically, I have no issue with this, and to be honest, I think it's a somewhat interesting and valid idea. But the way they implemented it is utterly awful. It's difficult to tell whether the person providing the voice was an inherently appalling actor, or if it was the sound processing which destroyed any human qualities and emotion they were putting into the performance, but the end result is something that sounds more robotic than your average speech synth. I almost felt compelled to click through my character's dialogue, except for the sheer "staring-at-a-train-wreck" voyeurism of hearing how truly terrible it was. I'm afraid to say that the sound designer responsible should be out of a job, and there really should be some serious questions raised with whomever listened to it and considered it acceptable. Maybe exaggerated anatomy is supposed to sell the game? Gameplay sure won't. Overall, I'm astounded by the DS3 demo. I've never before downloaded a demo for what is supposed to be a blockbuster AAA that was so comprehensively riddled with glaringly obvious flaws, poor design choices and hideously bad control systems. DS3 appears to be a case study in developers getting so familiar with their own game that they can't see its weaknesses, particularly since these shortcomings are a core part of the game rather than something that can be fixed in a short time-frame. For a game that I thought would be reasonably fun to pass some time, I'm now exceptionally glad that I didn't click that "Pre-Order" button on Steam. If I want my action RPG fix while I'm waiting for Diablo 3, I'll fire up Torchlight, and I'll be steering well clear of Dungeon Siege 3. That's one week of work, and I've been somewhat busy the past week, so have probably been less productive than usual. Admittedly some of that lost productivity is due to a little bit of gaming (Deus Ex, LA Noire and Gears of War), but even gaming teaches me more about good and bad game design. So even if I'm quiet about development work, rest assured that a substantial amount of effort is going into creating The Shattered War. 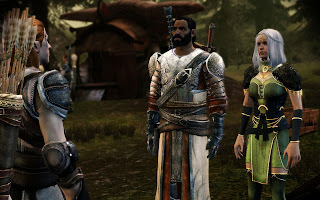 I was struck recently by a similarity by a character and scene in my first major mod, Fate of a City, and Dragon Age 2. This came as a result of a discussion of the emotional impact of Dragon Age 2, where the issue of Hawke's family was brought up. As anyone who has played the DA2 demo knows, one of Hawke's siblings dies in the opening sequence of the game, killed depending on the class choice of the player. If the player is a mage, then the sister Bethany (also a mage) dies, but otherwise, the brother Carver will die. Hawke's mother is overwhelming distraught, and Hawke also gets to utter a few words to his/her mother in an attempt to console her. Many players found this sequence forced and trivial, because they did not care about their dead sibling at all. They had known them for a matter of minutes, and had formed no real connection with them whatsoever because of the lack of interaction. On my first playthrough, where Carver died, I did not care a whit for him. In the short timeframe I had known him, all he had done was complain about my every decision. I wasn't really sad to see him die at all. Hawke's family: Who's expendable now? Hrm, I guess it's Carver. 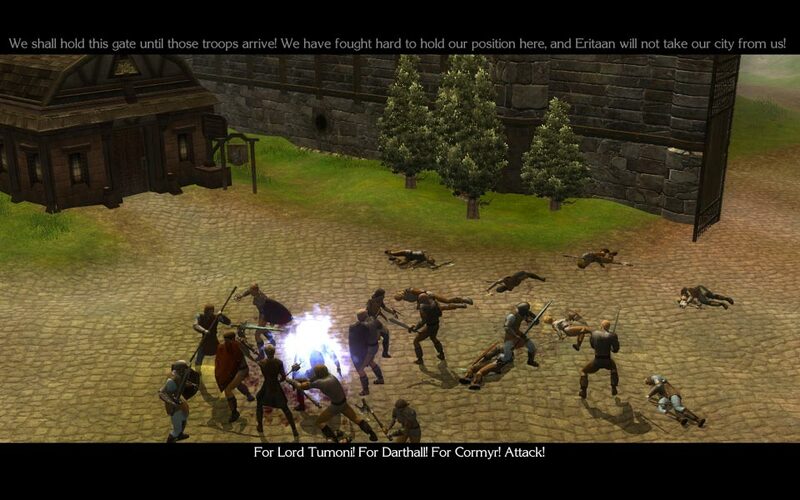 Comparatively, in Fate of a City, the game starts off with an attack on the city of Darthall. The player meets their apparent friend Meylana, who gives a brief run-down on the circumstances and situation. She provides the immediate setting in an interactive fashion rather than having it carried out entirely through a non-interactive cutscene (though you get that afterwards to show it play out as well). 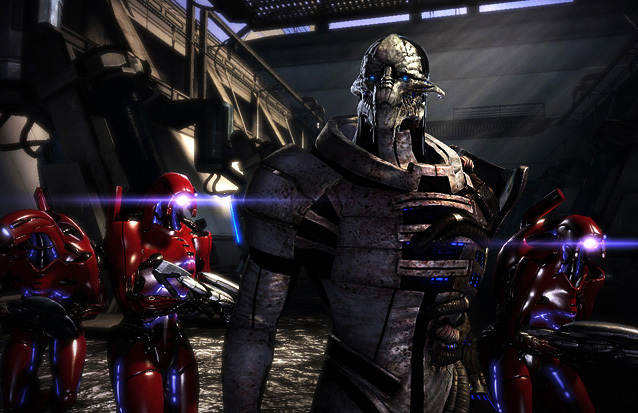 After the invasion, the player meets up with another friend/acquaintance, who informs them that Meylana has been killed. The player has the option to respond as though they cared (or didn't) and the dialogue continues and the friend provides the player with information they need to get in contact with people trying to fight the new rulers of the city. Some players critised my approach saying them simply did not care about Meylana because they didn't know her. I've also seen exactly the same criticisms leveled at your sibling's death at the start of DA2. In Fate of a City, I never expected players to care about Meylana. If they wished to decide for roleplaying purposes that they did, I gave them that option, but I gave them intermediate options that either indicated a lack of connection with her, or effectively ignored her death completely. I never had any expectation the player would form a connection, but used her as a means to motivate the NPC that they were talking to. The player already had impetus to fight against the invaders: revenge, imprisonment, wealth, safety, or a number of others reasons. Meylana's death was used as a means to provide motivation for an NPC. Similarly with DA2, your sibling's death cannot really have any major emotional impact on you. Hawke can deliver a line of a fittingly consoling nature to your mother, but the scene is not about Hawke's emotions, it's about Hawke's mother. The impact that their death has upon your mother is significant, and reiterated numerous times throughout the game. 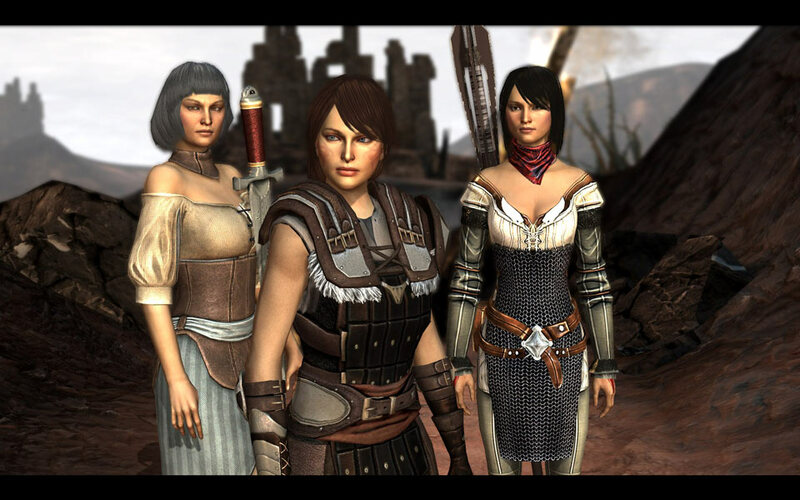 I'm certain that the writers were fully aware that the player wouldn't have time to form a meaningful connection with their sibling, which is why the focus of the scene is on the mother and not Hawke. The fact that your mother has lost one of her children is something that has a significant effect on her character, and thus on her interactions with you at key points in the game. Given the raft of players who complained about this in DA2, and those who took issue with it in Fate of a City, it appears that it may be a bad design choice. Part of this is due to the fact that players are constantly told by games that they are the most important person in the game. Now, to an extent, I'd have to say that I agree, as the player should be the one driving the story and making events happen. If everything is being driven at a high level by NPCs, then the player feels somewhat powerless to control their own destiny. Oddly enough this is completely true, because (in almost all cases) the player has to play through a pre-defined story with set events. When the player does not feel like they can control their path (even if that control is merely an illusion), they feel railroaded down a path. But of course, it is an illusion: in DAO you always defeat the blight, in Crysis you always defeat the mothership, in Warcraft 3: The Frozen Throne, Arthas always overcomes Illidan, etc, etc. The curiosity here is that sometimes players take their expectations too far and almost seem to demand that no one else can have any reaction to events because it impacts upon their experience as the protagonist. This mindset appears to be more prevalent in the RPG genre than other genres, and that's no doubt a product of the focus on providing player choice in this genre. The more you allow the player to be in control of their story and also try to effect them through emotional scenes, the more they will feel that they should be the only character for whom such scenes are made. Villains get the limelight, why can't others? To be honest, I might argue that's a failing on the player's part, particularly in an RPG. RPGs are designed to be built on the context of a believable world with believable characters. If those characters cannot be allowed to have their own (strong) reactions to situations and have the attention sometimes focus on them as opposed to purely on the player's character, then that believability is immediately lost. No, the player should never take a back seat for too long, but if the designers (and players) do not allow NPCs to occasionally take the limelight and develop and showcase their own emotions and reactions to situations, then the world becomes inherently less interesting and realistic. So how does this fit with your sibling dying in DA2? Is it a fault of the designers for not telling the players "actually, you're not meant to care here, but if you choose to for roleplaying purposes, that's fine"? Should designers expect that player will have a desire to care about someone that dies that their character supposedly knows well, and thus give them a chance to know them properly? Many people cared about their father dying in Fallout 3 (though that's possibly because Liam Neeson is awesome), yet there had been very limited opportunity to build any sort of relationship with him. Many people were sad to see Duncan die in DAO, again even though there had been little meaningful interaction with him. All this said, I'm still not confident that either Fate of a City's or DA2's scene relating to the death of your friend/sibling were wholly effective. Players felt that they should be feeling something, when arguably they weren't expected to. But we can have scenes that elicit an emotional response from an NPC but doesn't demand one from the player - typically when the friend of the random stranger we are helping dies in some fashion due to an unfortunate series of events. Quite often in this case, the player doesn't care about the dead NPC, but can empathize with the character who is feeling emotion regarding their death. In this way, the player actually gets the emotional impact via proxy - they don't necessarily care that someone is dead, but they can actively see that someone else is distraught as a result and this will elicit an emotional reaction. The issue appears to be where the NPC is someone the player "feels" they should have a connection to, like someone who is supposedly their friend or sibling. In this case, natural human psychology appears to come into play and the player expects that they should care, and thus becomes frustrated when they don't because they have no connection to the character who has died. In this case, the game is too powerful for its own good, demanding a natural human reaction when one cannot be given because the lack of that connection. The take-home message appears to be to not kill off a family member or "friend" of the player character unless the player has been given the chance to know that person. Otherwise the player will expect that they should feel something, even though they won't. My first thought upon watching this video was "How does this guy get paid to do this?" Jim Sterling tries to address the preposterous nature of some of the Call of Duty hate through his "pseudo-intellectual parody" where he exaggerates criticisms to the point of ridiculousness. While exaggeration is a valid tactic for satire, such an approach undermines the validity of an argument when it fails to address strong criticisms of the series he is trying to defend. No one expects Call of Duty to be "art", and anyone who does has about as much critical credibility as Statler and Waldorf. His attack on this point appears to be an attempt at humour, but I'd say it falls well short of the mark. His discussion of the perk system implemented by CoD is one area where his argument falls hideously flat. He covers some of the benefits of CoD's style of play compared to the Quake/UT, but fails wholeheartedly to even recognise that there are negatives. Declaring that there is no difference between a player who has learned the layout of a quake level to a player who has lots of perks in Modern Warfare demonstrates how oblivious he is to concepts of game design. In Quake, the disparity between players comes from the skill of using various weapons, knowing the layout of a level, and the tactics as a result of player movements, current weaponry and the flow of the game. All these factors apply equally to the Call of Duty series, but then players with more experience have the added advantage of having more powerful weapons available to them upon spawning, not to mention perks that enable them to do things like take more damage, move faster and carry more ammunition. To argue that this does not exacerbate the inherent disparity between old and new players is utterly ridiculous. Jim also fails to recognise that Call of Duty's approach provides players rewards through perseverance rather than skill. If you play for long enough and rack up experience through kills, assists or other means, you will "level up" just like in an RPG and gain access to better weapons, perks and advantages over new players. Even taking the example of players who start at the same time, better players will raise in rank faster, thus giving them access to better gear over their less skilled adversaries, which will widen the gap further. He even fails to address killing streak bonuses that further push the balance of the game in favour of the more skilled or winning player(s) during individual matches. Even his primary argument against the Quake/UT style of play is steeped in ignorance. There are disadvantages to having everyone run to the same powerful weapon on a level, but the fact that he makes this argument shows that he does not realise that not all players will run for that one weapon. Any level designer with a modicum of talent for such games will make a level such that more powerful pickups are be balanced by having them placed in more precarious positions to retrieve. Not everyone runs for the rocket launcher, because others will run for the sniper rifle and pick off the people attempting to grab the rocket launcher. As for his opinions on the single player campaign, I couldn't disagree more. The criticisms of Modern Warfare's campaign are few and far between, and typically revolved around the mechanics issue of the player being forced to move forward with little to no support from their squad, and the never-ending stream of enemies should they fail to do so. However, these are perfectly valid issues to be raised as they were a cause of consternation for many players. But again, his failure to recognise the weakness of the subsequent two titles in comparison to Modern Warfare apart from saying "they get a little far fetched at times". To neglect the raft of weaknesses of Modern Warfare 2 and Black Ops in comparison to Modern Warfare suggests that he doesn't even realise they exist. The only real point that actually carries any sort of weight is the criticism directed at CoD players simply for being CoD players. Yet much like the "Call of Duty is not art" argument, this is so shallow and juvenile that it barely deserves the dignity of a response. Anyone making this argument is unlikely to possess the intellect or objectivity to actually listen to a reasoned rebuttal, and unfortunately for Jim, this is the only point of his video where he actually manages to do that, at least until he makes himself sound like something with a chip on his shoulder because he's been called a "CoD lover". At least he does express his disdain for the $15 map packs of the series. Given that Jim Sterling apparently does work for a lot of game sites, maybe I'm picking a fight here that I shouldn't. But in this case, criticism where criticism is due, as he's not demonstrated even a basic level of understanding of FPS game mechanics. As far as I'm concerned, being unable to construct a solid argument on why CoD is a good series (which it is) shows an amazing lack of insight, and that's coming from someone who will happily declare that MW2 is one of the least inspiring and over-hyped FPS games delivered in the past few years. I'm beginning to think it's time I put in for a position to write articles or videos for the Escapist, Destructoid or other game websites.